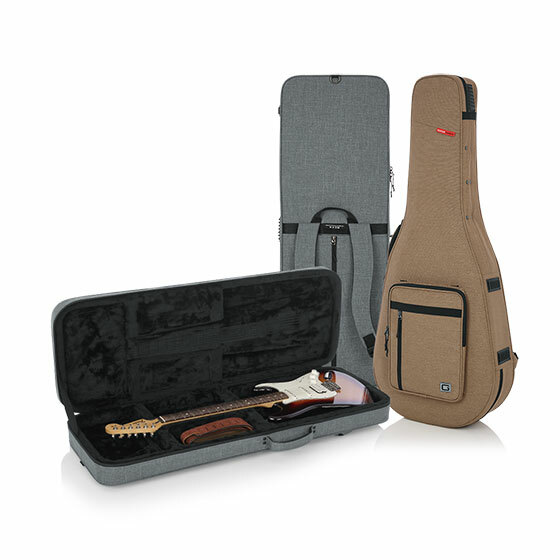 Gator has taken the styling of their popular Transit Gig Bag Series and combined it with the durability of the GL Lightweight Series to create the new Transit Rigid Series Lightweight guitar cases. They are the ultimate hybrid series and designed to fit electric, bass, and dreadnought guitars. Don’t let this case’s stylish exterior fool you, protection is their number one priority. Your guitar is more than safe being immersed in dense EPS foam with premium plush lining. Keeping one of the original Transit Series’ most loved qualities, these new cases provide great organisation and enough space for your guitar accessories. There is plenty of room for capos, strings, picks, and anything else you may need in the cases’ internal accessory compartment. Still need more storage? There’s also a large external zipper pocket on the front of the case with an additional layered zipper pocket. The soft-lined pocket provides quick access to phone, keys, and small electronics. This is extremely helpful during travel and on the go! The Transit Rigid Series cases provides not one, but three different options for transport. You can use the comfortable moulded, padded, and contoured handle to hold the case beside you, the padded backpack straps for hands-free use, or just pick it up by the top grab handle. When you aren’t using the backpack straps, you can conveniently tuck them away in the hideaway compartment on the rear of the case so they aren’t in your way. Check out the new Gator Transit Lightweight Cases here.